Discover a new way to work with IBM LinuxONE systems. 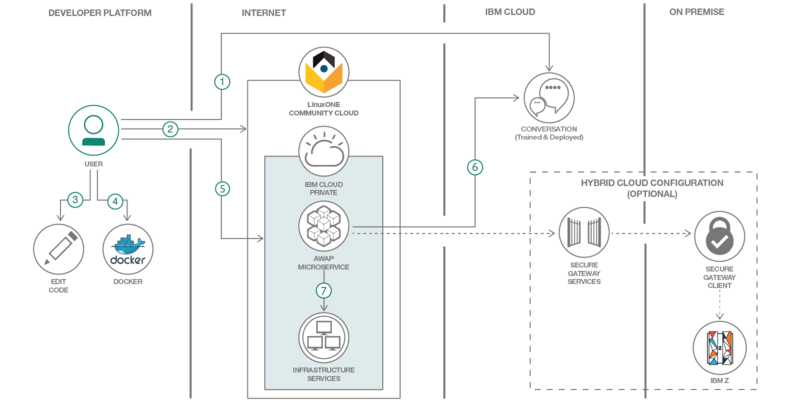 This code pattern shows how to build and deploy a cognitive microservice with IBM Cloud Private running in the IBM LinuxONE Community Cloud. It uses REST APIs to deploy services through a simple conversation in human natural language to an IBM LinuxONE system. IBM Cloud Private is a private cloud platform for developing and running workloads locally. It’s an integrated environment that enables you to design, develop, deploy, and manage on-premises, containerized cloud applications behind a firewall. In this code pattern, you’ll create a cognitive service with an IBM Watson Assistant service in IBM Cloud and load a pre-defined corpus. You’ll code and create a Docker image (Node.js application-based microservice) and publish it to the IBM Cloud Private Docker registry, then configure and run a container based on the previous Docker image from the IBM Cloud Private catalog. A chatbot interface allows you to talk with the IBM LinuxONE System to deploy cloud services. Access IBM Cloud and define an IBM Watson Assistant Service (1 & 2). Fork the code from the GitHub repository to your workstation and build your Docker image (3 & 4). Deploy and test your microservice in IBM Cloud Private on the IBM Community Cloud (5 & 6). Create an IBM Watson Assistant service and configure it. Build and deploy a Docker image to IBM Cloud Private. Build the Docker image from the LinuxONE Community Cloud. Deploy the Docker image to IBM Cloud Private. Instantiate the provisioning chatbot from the IBM Cloud Private catalog. Run the application: Talk and get it done with IBM LinuxONE Systems. Extend this solution to access your on-premises servers.